Long known as a veterinary wasteland, Kampot now has several vet options. Koh Pich Veterinarians is a Cambodian-run clinic across from Kampot’s main market that offers basic and inexpensive veterinary services and vaccinations. The Phnom Penh Animal Welfare Society (PPAWS) brings qualified veterinarians to Kampot every three months or so, offering a wide range of services and surgeries. They have open consultation hours for simple things like vaccinations, but for anything more complicated you should make an appointment in advance. Prices can be on the high side, (vaccinations $20 to $30, cat spaying/neutering $90/$40 and dog spaying/neutering $120/$90), but the care you receive is high quality and from properly qualified veterinarians. Plus you’re helping to support PPAWS’s animal welfare programs. Watch the Kampot Noticeboard Facebook group for upcoming visits. A happy and healthy Kampot doggy. 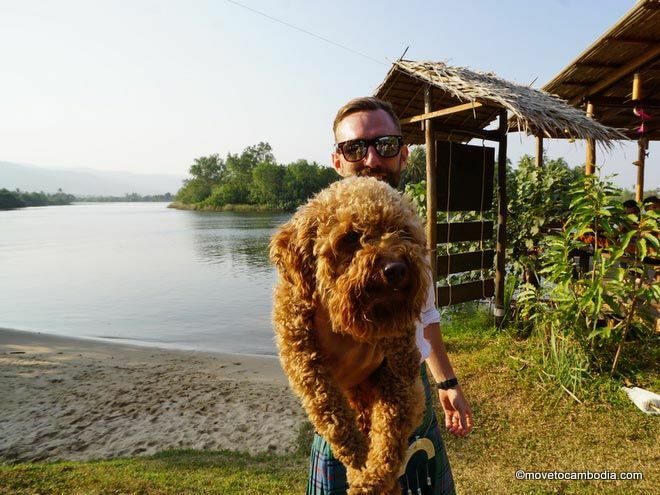 Reggie of Kampot Veterinary Services is a Russian veterinarian offering veterinary services, including consultations, travel documents, spaying, neutering, and emergency care. He comes recommended by local expats and is available 24 hours a day and does house calls. Cat spaying costs $60 and neutering is $45. For dogs, the price is based on their weight and the quantity of anesthesia used, but starts at $70 for spaying and $60 for neutering. If none of the above are available, there’s an excellent vet in Sihanoukville, Dr. Roman Kuleshov, of the Happy Pets Veterinary Clinic who is very highly regarded. Open daily, 7:30 a.m. to 5 p.m.